Our club, Absolute Aikido, was created by Steve Usher in 2009 and originally trained at the Dereham Lesiure Centre. We moved to our new home, The Studio Martial Arts and Fitness Centre, in Feburary 2013 with a specially made dojo with heavily sprung floor and thick matting suitable for Aikido practice. At this this time Sensei Jeff Podolski took over as Instructor. We are member of the Makoto Aikido Association and the British Aikido Board. 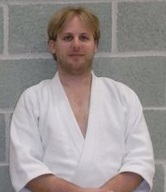 He started training in Aikido with Sensei Huw Dillon in 1999. After moving and joining Sensei Steve Usher’s club he has gotten the opportunity to train with many other clubs and students. He has had the pleasure of studying further under Sensei Frank Burlingham and Sensei Vince Hammond over the past 5 years.